So, I know Shikoku come in Black, White, Black Sesame and Red Sesame, but I was browsing through Shikoku Pedigree and found a dog listed as "銀胡麻" basically Silver Sesame. It is the only Shikoku listed under that colour and it was bred by the 山水荘 kennel. I took to Google Images and searched for 銀胡麻四国犬 but nothing came up at all. Is this Shikoku a one off Silver Sesame or is this a discrepancy on the database? Or perhaps it's just a Shikoku with a hugely diluted colour seems it appears to be one of the earlier Shikoku from the 1950s? It's piqued my interest a lot, especially seems I can't find anything on it via googling it. The NIPPO Number is listed as 15506 on Shikoku Pedigree. "Silver" just means really low intensity gold/grey pheomelanin pigment. Pheomelanin is the tan/red pigment, while eumelanin is black/liver/blue pigment. I haven't heard it used for the other Japanese breeds before so I'm not surprised you've only come across the one. 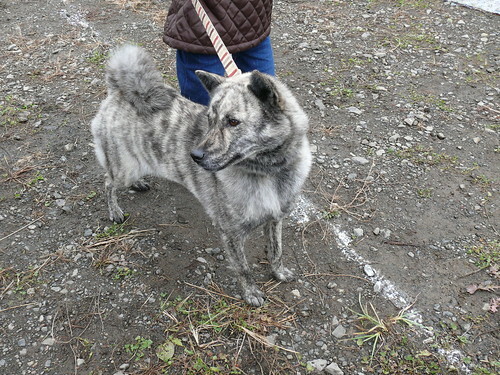 It's used commonly with the Akita for brindle dogs. 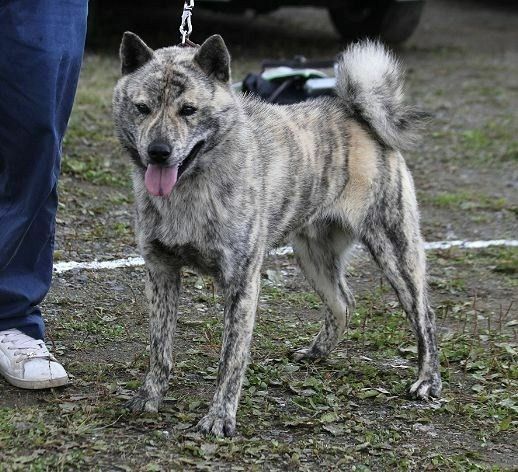 However, whether a dog is red/black/silver brindle in Akita is purely a judgement call and description that owners use; the registration only says "brindle." Interesting side note: The Hokkaido Ken Hozonkai (DOKEHNHO) recognizes a 6th color fot the Hokkaido that NIPPO does not: 狼灰. Roughly translated as wolf grey. I have only ever seen photos of one dog reported to be this color, and it was a sesame (agouti) dog with really pale pheomelanin. So you could call it a silver sesame I suppose. "Silver sesame" would be a fault per NIPPO, I imagine, which may be why it's never overtly written or documented. It's not a common color. I would think it's something similar to the "white sesame" (shirogoma) found in another Shikoku thread somewhere on the forum. I found the dog. Looks like it was also born sometime in the 50s or soon after, so colors may have been different back then for the Shikoku. @PoetikDragon I have heard of Silver Brindle Akita, I'll be honest when thinking of a Silver Sesame Shikoku I'm thinking of the same kind of silver that Akita Inu have :)) Aside from Akita Inu, until I found this Silver Shikoku, I only knew of Ryukyu Ken coming in Silver. The head of the Ryukyu Ken Hozonkai has a pack of Silver Brindle Ryukyu at the moment. Interesting that Hokkaido have a "Silver" colour... I'll need to look it up. I knew Hokkaido came in other colours other than white (Brindles, reds, etc.) but didn't know they had a Grey colour. I guess that white hides a lot underneath, lol. @Crispy yes it is a fault. I have heard tales of White Sesame Shikoku. I think Shigeru mentioned them on his blog once. I'll have to look up the White Sesame Shikoku and see it. I wouldn't be surprised if they're the exact same colour honestly... In Ryukyu Ken both White and Silver is all classified under "Shiro" and so are some lighter Cream coloured Ryukyu so I don't doubt something similar, wherein, "Shiro" and/or "Gin" is just an umbrella term for light coloured dogs. Still, thank you for reminding me of the White Sesame Shikoku! I did forget their existence until you mentioned them, haha. I didn't know that akita and hokkaido have only "brindle." Kai are registered as akatora, chutora or kurotora with the Kai Ken Aigokai. I think in AKC my dogs are registered "red brindle" and "black brindle." As far as I know only the Kai differentiate the brindle on their registration... probably because they’re ALL brindle. Akita only have one tail type, so no for them. No idea about other breeds. I once thought only Shikoku separated sesame... until I got Nami's pedigree and it said she was registered as "red sesame", specifically. We register tail type in NIPPO. Ryukyu Ken Hozonkai specifically state the different brindles: Aka tora, kuro tora, shiro tora. They also separate the two Red colours as "Aka (Golden Eye)" and just "Aka". Although, despite Ryukyu Ken coming in more than 1 tail type they don't register tail type in any of the RKH pedigree's I've seen. It's interesting that the KKA register the different tail types. The current standard for the Shikoku coat color recognizes sesame, red, black (black/tan), and white. White is penalized. There are four variations of goma (sesame) used when registering pups: goma (equal parts red/black sesame), kuro-goma (more black than red colored hairs), aka-goma (red base with black hairs mixed in), and shiro-goma (white base with black hairs mixed in). Shiro-goma while listed in the Nihon Ken standard, is seen in Kishu, but would be heavily penalized in the Shikoku as a dog that was lacking pigment. While I believe you could still register a pup as shiro-goma, today a light colored pup would probably be registered as a goma (sesame).